Following my recent post about the olive harvest, this one is about a visit to our local oil mill. After helping our neighbour pick his olives, we headed to the mill, just a few kilometres away. 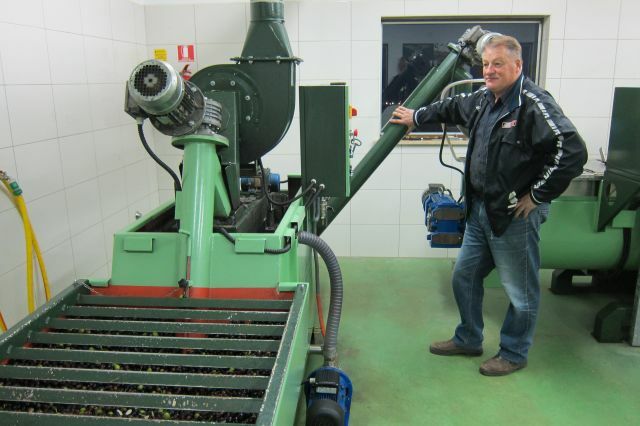 Ideally, olives should be pressed within 24 hours after harvest. For this reason, the oil mills often work around the clock at this time of year (and are closed for the rest of the year!). 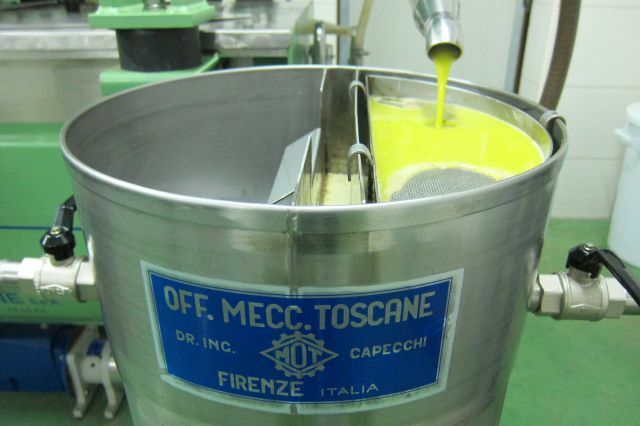 There are about 30 olive oil mills in operation across Istria. When we arrived, there were no customers ahead of us – but several showed up just a few minutes after we did. First the bags of olives were stacked onto a palette and a forklift was used to move the whole lot onto a large scale. The weight came to 245 kg. This was the weight of olives that had been picked over the previous two days, but there were many other trees still waiting to be picked. Next the bags were moved into the room where the huge Italian press machine was waiting. 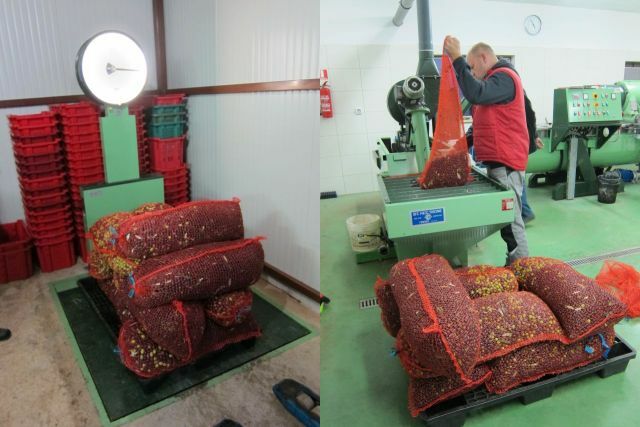 The bags were opened one by one, and the olives emptied into the machine. There are several stages to the pressing process. The first step is to wash the olives and separate the leaves and any debris. 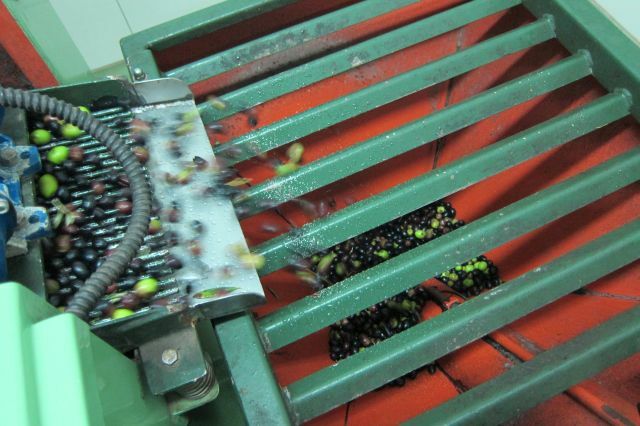 Next, the olives move into another compartment of the machine where they’re crushed into a paste. The third stage is centrifugation where the oil is extracted from the paste. The temperature at this and all stages of the process cannot be higher than 27 degrees Celsius. Sure enough, there was a temperature gauge on the machine and it indicated 27 degrees. If the temperature climbs higher than this, then the oil would not be considered to be ‘extra virgin’. This is why extra virgin olive oil is sometimes described as ‘cold pressed’ or ‘cold extracted’. This machine could process three different batches at the same time and had three different compartments for washing, crushing and centrifugation. 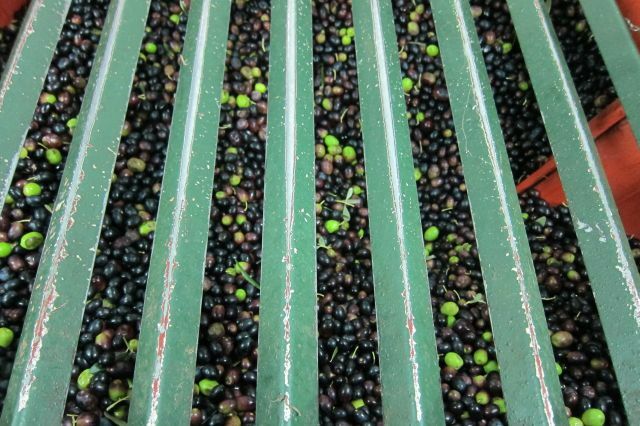 This ensures that one client’s olives are not mixed with another’s, and that each client takes home his or her own oil. The cost of pressing is charged per kg. At this mill the cost was 1.5 HRK (0.20EUR / 0.21USD / 0.28CAD / 14INR) per kg. The whole pressing process took about an hour in total. When the first drops of oil finally appeared, it had the colour of pea soup. We each took a small cup and tasted this freshly pressed olive juice. It smelled of freshly cut grass and the taste was very fruity and peppery at the same time. When we tasted it again later at home (our neighbour had given us a few litres of this precious juice in exchange for our hard work!) after it had had time to settle, it was even more delightfully fruity in taste. From 245 kg of olives, our neighbour got 37 litres of olive oil. This should be more than enough for a family’s consumption for the whole year. The price for a litre of locally pressed olive oil starts at 80 HRK (10EUR / 11USD / 15 CAD/ 740INR) and can be twice as much for an organic variety. The stuff you get at the supermarket is of course much cheaper, often half this price, but inferior in quality and often not real extra virgin olive oil at all. But there’s nothing like the real stuff. I feel so lucky to live in a place where I can get pure, extra virgin olive oil produced locally and know it’s the real thing.